So on a whim I stopped by goodwill two weeks ago for a baking pan (yes, I finally got sick of getting food poisoning every other week so I'm learning to cook.) 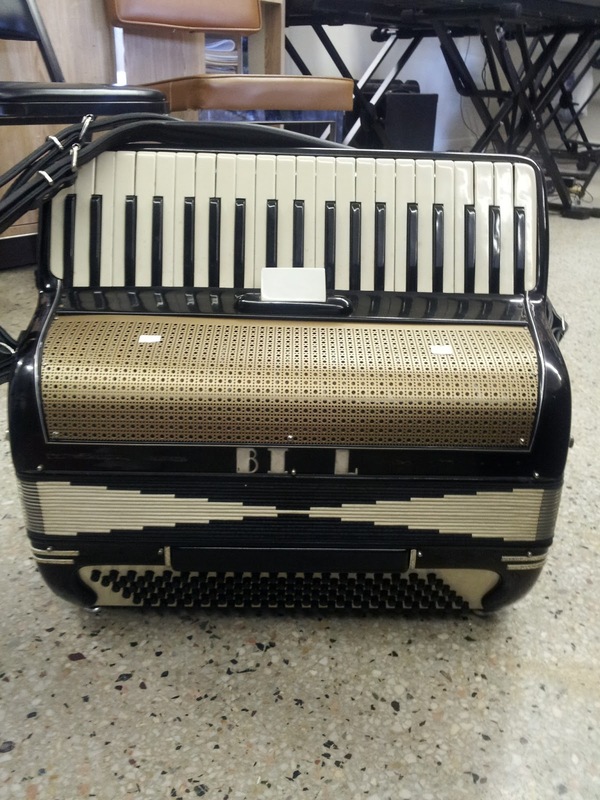 and found myself staring at an accordion they had for sale, which is kind of an extreme rarity... I don't normally frequent Goodwill but I've never seen an accordion inside one before. This accordion was old, extremely busted, but I could tell that it had a really good sound. The Faceplate was missing so you could literally see right into the inner workings of the accordion. Some of the keys were warped from years of neglect. The back-padding on the keys had completely rotted out, meaning they click when depressed. The entire thing was horribly detuned (the owner possibly smoked) and there was a constant "wheeze" coming from one of the lower keys. 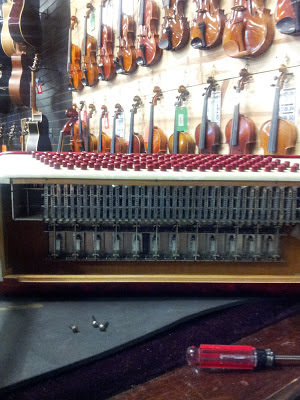 Some of the buttons stuck, some of them had fallen inside of the accordion itself. The shoulder straps (used to "wear" the accordion) were extremely worn and one of them had completely ripped in half. The letters on the accordion (generally indicating the model) had fallen off except for "BI_L". It happened so long ago that I was unable to see if there were letters before or after the BI_L letters. 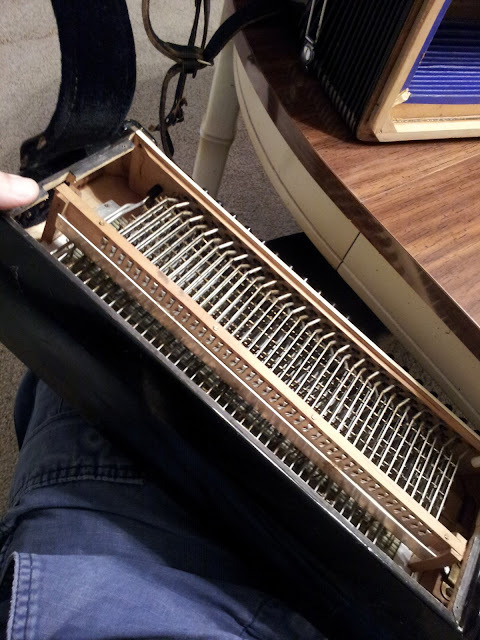 The frame of the accordion had become frail and warped in places (moisture damage), making repairs incredibly difficult because the wood had warped around the screws. So I brought Bill with me to band practice the following weekend and the guys really liked him. They (at least Moose) agreed that Bill sounded better (er... would sound better if he were tuned) than my current accordion (Titan), so I decided to bring Bill into the only accordion repair shop in Florida for a tuning, Accordions and Keyboards. Upon examination I was told that the tuning required to make Bill sound good on the keyboard side was minimal but the damage to the buttons side was incredibly extensive due to the sheer number of buttons out of tune and the extreme nature of the frame warping. 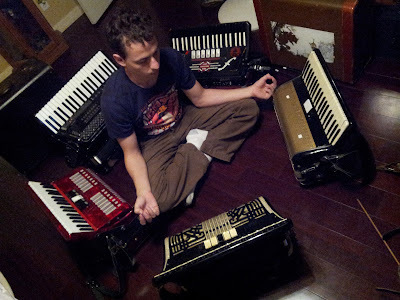 I was told that it would be better to just buy a new accordion (and a lot cheaper) than to attempt the tuning... I was pretty disheartened to hear the news and I tried out a dozen accordions around the shop that fit my basic but extremely detailed specifications (full keyboard, lady-sized keys, 2+ reeds, 120 buttons, lightweight, and most importantly: needs to 'feel' right). It was really weird because none of the fantastic accordions I tried could match the feel or tones of the keyboard side from the accordion I found at Goodwill. It was a frustrating process (because I'm extremely picky) but the closest thing I could find was a single accordion that had tones 'almost as good' on the keys side but a button side that was vastly superior to Bill's. It was a 1960's accordion made by a completely different company. Still, I REALLY liked Bill better because I felt an odd connection (imagine you found a stray pet), so I was uneasy about giving up on him. As I set both accordions down, side by side to play with they keys, confirming my decision (If I wanted to really give up on Bill or not...) I noticed that they seemed to be exactly the same size with the same pin configuration (a REAL oddity in the accordion world). I randomly asked the accordion shop owner if I could try putting the button/bass side from the other accordion on Bill and he said that while he'd be open to me trying it, it would never work... "Odds of your accordion fitting with this one made in a different decade by a completely different company, in a different country are between zero and one percent. They might look alike but that's about it." Regardless, he was a good sport, we tried it and were both amazed when it worked! Just to reiterate, there are no "standard" sizes to accordion-making and two COMPLETELY DIFFERENT ACCORDIONS made in different decades by different people in different countries were compatible! So instead of paying a lot of money to repair the busted and warped button-side on Bill (that would not sound all that great when fixed), I was able to spend a lot less to get a completely amazing button side from a newer accordion that was even the same color configuration as Bill! A mesh face plate that allows people to still see inside while protecting his insides (it's fantastically loud). A new set of shoulder straps to replace the temporary fix I put together. Extreme reinforcement to keep both halves of the different accordions together. Additionally I've notched the button-sides in a traditional manner and have marked tape on the places where an internal/external microphone system will soon be in place. When I drove back to Clearwater to pick up Bill I got to talk to the accordion repairman, who admitted he was perplexed with my request and told me that it was like nothing he'd ever had to work on before. 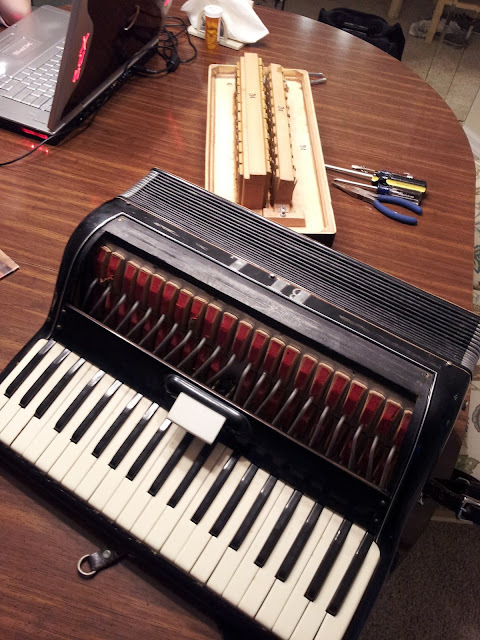 Accordion repair is extremely specialized (few accordion doctors exist) and while it took a few weeks to complete, he was able to accomplish the task. He told me all about the repair process and verified that it was a 1940's accordion (Fun fact: 1930's used a different type of material in their keys that is... well... extremely flammable and possibly even explosive). He also verified the name as being "Bill", put in a few extra nice features (a custom fitted snaps for keeping the accordion from opening when stored) and was extremely reasonable on the repair costs (he even threw in a new accordion case!). Now that it's done I hope you guys will take a moment to notice the new accordion (which I've almost exclusively been using for the new RE album: Let Me Tell You a Story) and the vast improvement in sound at shows, assuming my home-made internal microphone rig works in the manner it's intended to. I'll have to be a lot more gentle with this one because it's not nearly as sturdy as Titan, but I'm very happy with how things turned out! Update: I got to try Bill out at one of our smaller shows! http://www.youtube.com/watch?v=IrHEits36VQ (Fast forward to 8:20). I want to contact you, but, alas, I have consumed too much whiskey to find a proper email address or any such thing! I have fallen completely in love with the story of wonderful Bill! I was sitting here this eve in a strange, melancholy mood. Staring at my purple squeezebox (Squeezy B! ), I wrote a melodramatic song about a broken accordion, and then I proceeded to conduct a Google Image search for "broken accordion". It resulted in some of the most beautiful images I have ever seen, and then it brought me to this lovely tale. Bellissima!